Understanding Air Pollution with Art: "The Air of the Anthropocene" and "Mutual Air"
Using a custom-built digital light painter and wearable particulate sensor, I take long exposure photographs that paint the amount of PM2.5 particles in the air as particles of light. As the light painter’s sensor detects more pollution it draws correspondingly greater numbers of light particles into the photograph. The effect is as if the microscopic pollution has been enlarged and lit up, shedding light on the invisible particles. Mutual Air is a network of roughly thirty specially designed bells that generate a soundscape reflecting and responding to the changing composition of our local and global atmosphere. By sonifying air-quality fluctuations, Woo hopes​ to engage the public in an experiential understanding of climate science and how aspects of our atmosphere, while a shared resource, reflect socioeconomic disparities. A new report titled “Political Leaders Position and Action on Air Quality in India” released by Climate Trends also highlighted that members of parliament in 14 Indian cities, among the most polluted cities globally as per the WHO 2018 urban air quality database, have done little to get their cities to comply with safe air quality standards locally. “The manifestos of both the national parties have proven that political parties cannot ignore and neglect air pollution related health emergency any more. This rhetoric is a good sign. But the bigger question is - if this electoral promise will translate into strong enough political will to push for hard action with accountability and show results,” said Anumita Roychowdhury, executive director, Centre for Science and Environment. Delhi’s air pollution levels recorded a fall in 2018 because of multiple strategies, she added. The BJP’s Manifesto was released in the last few days. A little hard to hunt down, initially, though a PDF is hosted at documentcloud. We have evolved technologically better strategies and devices to map the level of pollution in cities and rivers and have taken effective steps to reduce the level of pollution in major cities, including the national capital. We will convert the National Clean Air Plan into a Mission and we will focus on 102 most polluted cities in the country. Through concerted action, we will reduce the level of pollution in each of the mission cities by at least 35% over the next five years. Another part of he Manifesto is framed around 75 milestones for India’s 75th anniversary, including some focusing on health, energy, air pollution, and water & sanitation. Ensure a pucca house to every family. Ensure the LPG gas cylinder connection to all poor rural households. Ensure 100% electrification of all households. Ensure a toilet in every household. Ensure access to safe and potable drinking water for all households. Bharat Mission to achieve ODF+ (Open Defecation Free) and ODF++ in cities and villages. Ensure ODF status for all villages and cities. Work towards substantially reducing the current levels of air pollution. Work towards completely eliminating crop residue burning to reduce air pollution. The opposition Congress party in India released their “manifesto” — a party statement across a range of issues — a few days ago. It is long and has rough (sometimes detailed, sometimes vague) policy outlines. Of particular interest are a number on energy and health. Congress promises to enhance availability of, and access to, electricity in rural areas by encouraging investment in off-grid renewable power generation with ownership and revenues vesting in local bodies. Every village and every home will be electrified in the true sense. In the long term, we aim to substitute LPG used in homes by electricity and solar energy. Congress promises an action agenda that will place India at the forefront of the battle against global warming and for the protection of the environment. At the same time, Congress will defend and advance India’s interests in international negotiations on Climate Change and the Environment. We will constitute, by law, an independent, empowered and transparent Environment Protection Authority (EPA) to establish, monitor and enforce environmental standards and regulations. The EPA will replace all other bodies that currently exercise jurisdiction and powers. Congress recognises that air pollution is a national public health emergency. We will significantly strengthen the National Clean Air Programme in order to urgently tackle the problem of pollution. All major sources of emission will be targetted, mitigated and reduced to acceptable levels. Sectoral emission standards will be set. Congress promises to provide clean cooking fuels at affordable prices to all the households of the country. We will monitor the price of LPG cylinders and mitigate through subsidies the burden of price increases on the homemaker. We will expand the ASHA programme and appoint a second ASHA worker in all villages with a population exceeding 2500 persons. Congress will implement a programme that will enable State Governments to revamp and equip the network of primary health centres (PHCs). PHCs will provide all primary health services, including preventive measures and wellness services, and become referral centres for serious medical cases. Para-state workers such as Anganwadi workers, ASHA workers, rozgarsahayaks, preraks, and anudeshaks, form the backbone of the public service delivery system. We will increase funding for the relevant programmes and work with State Governments to ensure that all arrears are paid immediately. We will also work with State Governments and attempt to address all pending contentious issues regarding their salaries and work conditions. In addition, we will expand the ASHA programme and appoint a second ASHA worker in all villages with a population exceeding 2500 persons. Pillarisetti A*, Jamison D, Smith KR. 2017. The Impact of Household Energy Interventions on Health and Finances in Haryana, India: An Extended Cost-Effectiveness Analysis. In C. Mock, O. Kobusingye, R. Nugent, K. R. Smith (Eds. ), Injury Prevention & Environmental Health, Disease Control Priorities, third edition, volume 7. Washington, DC: World Bank. Probe-based measurements of moisture in dung fuel for emissions measurements. Twenty minutes from INCLEN’s SOMAARTH field headquarters lays Bajada Pahari1, a sleepy, picturesque village of ~120 households. The road to Bajada Pahari twists through bustling little villages, becoming more and more narrow until what remains is suited more for bullock carts, tractors, goats, and shepherds than personal vehicles. As the settlements dwindle, large open croplands — of tall sugarcane, bright yellow mustard, and various green sabjiyom2 — dominate the field of view. Enormous metal structures for high voltage powerlines stand erect yet untethered: no cables connect them. Below, and all around, the landscape is dotted with small, oblong discs of gobara3 used for fertilizer and as fuel. Bajada Pahari is trapezoidal in shape, buttressed to its north by a small hill, upon which sits an old, abandoned watchtower4 and a small informal shrine to Shiva marked by narrow, red flags. Immediately behind the ridge, a green pool sparkles in the hazy winter daylight. Stray dogs roam a nearby shallow dig - perhaps an old quarry. Looking away from the village, pasturelands extend for as far as the eye can see. Barely visible brick kilns spew grayish black emissions. From the hilltop, the only audible sounds are chirping birds and rustling leaves, punctuated occasionally by a wailing child, a barking dog, a puttering engine. 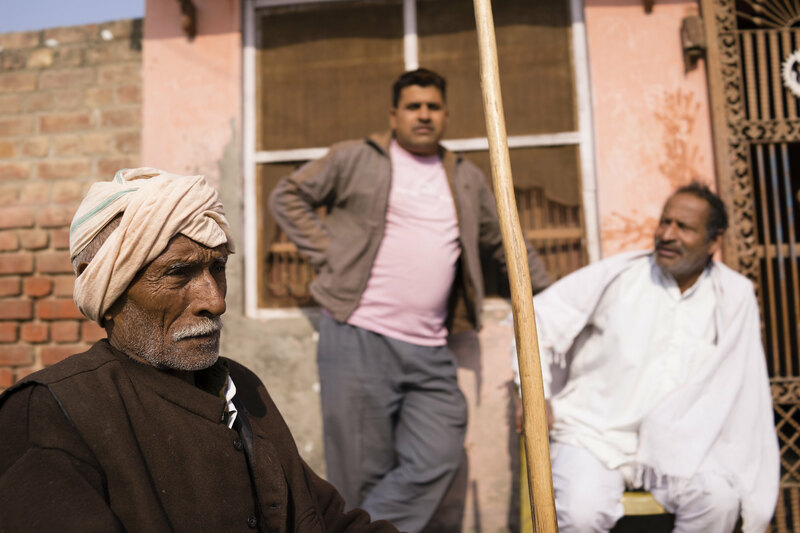 We arrived in Bajada Pahari mid-morning and went first to the home of the Sarpanch, the head village elder5. At his residence, on the edge of town, a large gate opens first into a foyer full of mechanical farm tools — a tractor, a manual chopper — and a few simple cots and then leads into an outdoor space with trees, cows, chairs, and chulas. The Sarpanch arrived shortly thereafter, on a motorcycle bearing his title. After initial pleasantries and introductions, we discussed the village, which won an award for progress on sanitation and cleanliness, and our air pollution project. Village air pollution is a hard concept to grok. For most, the pervasive images conjured by the word ‘rural’ are clean and pure, especially compared to places like Delhi, Mumbai, and Beijing. The sources of air pollutant emissions are no doubt different — quaint cookstoves, open fires, brick kilns, and small village industries look innocuous when compared to massive smokestacks and endless diesel vehicles visible in large Indian cities6. Tens to hundreds of these little village sources, simultaneously used over a small geography, probably adversely impacts air quality. Think of each one as a small contributor to a larger village smokestack. The sarpanch is (unsurprisingly) thoughtful, measured, and interested. Mayur explains what we’d like to do, and why, succinctly and in simple language - a difficult feat he has perfected in his years with INCLEN. We talk about why we’re interested in understanding air pollution in a rural village (unmeasured, significant, and likely related to simple combustion of wood and dung) and why we think it’s important (trying to convince government to monitor and regulate the entire airshed, not just in urban areas). We show him some of our toys — including a miniature quadcopter, similar to the larger one we’ll use to measure some meteorological parameters and PM2.5. He laughs at the copter and approves of our plans. He decides we should discuss further with others on the village council. We walk down the street, past a few cows lounging next to an abandoned biogas plant. At the intersection of two of the town’s biggest roads, a group of men and empty plastic chairs await us. Our discussion with them is similar to the previous one with the sarpanch. A few sarcastically questioned if we are asking them to stop cooking entirely. Others suggested their households, as proxies for the village, would be enthusiastic to move to LPG if the hassle of acquiring fuel wasn’t so great. They noted that there were no home deliveries and that it was difficult to coordinate pickup and dropoff of the cumbersome cylinders. One man, in particular, railed against the notion that food cooked on LPG was any different than that cooked over an open fire; he opined that it wasn’t the fuel that made the food, but the cook. His example was of village boys, who move to a city and eat food cooked on LPG by a stranger; they blame the poor taste on the fuel. He blamed the cook — or, more accurately, the fact that this food wasn’t the food they grew up eating, that they were accustomed to. A pretty neat (and new) insight. Not atypically, we spoke with only men about tasks they weren’t directly involved with. We learned a little about electricity in the village, as well. It is reliable and consistent — rare for these areas. It arrived first in 1978. Many households have multiple electric appliances, including a washing machine, metal rods used to heat water, fans, and small electric stoves known as ‘heaters’. Our final task in the village involved locating a site to place an ambient air pollution and meteorological monitor, along with associated solar panels. We found a nice rooftop location, in the center of town, adjacent to a beautiful, decaying old farmhouse. NYT: "Emissions From India Will Increase"
The minister, Prakash Javadekar, said in an interview that his government’s first priority was to alleviate poverty and improve the nation’s economy, which he said would necessarily involve an increase in emissions through new coal-powered electricity and transportation. He placed responsibility for what scientists call a coming climate crisis on the United States, the world’s largest historic greenhouse gas polluter, and dismissed the idea that India would make cuts to carbon emissions. “What cuts?” Mr. Javadekar said. “That’s for more developed countries. The moral principle of historic responsibility cannot be washed away.” Mr. Javadekar was referring to an argument frequently made by developing economies — that developed economies, chiefly the United States, which spent the last century building their economies while pumping warming emissions into the atmosphere — bear the greatest responsibility for cutting pollution. Not great news. Vox has interesting coverage of this story, as well; the bottom of their story has a great collection of links. I’ve got some fundamental issues with this recent article in the NYT, starting with its absurd title: Beijing’s Bad Air Would Be Step Up for Smoggy Delhi. The difference between levels in Beijing and Delhi are nigh indistinguishable shades of the same grey - we’re seeing similar and important trends playing out in large urban centers. We know the levels are health damaging and we know that the exposure-response relationships for a number of health impacts are not linear - a decrease from 400 to 300 ug/m3 doesn’t incur the same benefit in a population as the decrease from, say, 150 to 50 ug/m3. The latter decrease seems to have a far more profound and substantial positive impact on health. That, of course, is not to say we shouldn’t applaud any and all decreases in ambient air pollution — but instead to emphasize that we have a long way to go to fully protect public health. … [For] the first three weeks of this year, New Delhi’s average daily peak reading of fine particulate matter from Punjabi Bagh, a monitor whose readings are often below those of other city and independent monitors, was 473, more than twice as high as the average of 227 in Beijing. By the time pollution breached 500 in Beijing for the first time on the night of Jan. 15, Delhi had already had eight such days. Indeed, only once in three weeks did New Delhi’s daily peak value of fine particles fall below 300, a level more than 12 times the exposure limit recommended by the World Health Organization. But even this doesn’t tell the whole story. Rural India is fraught with air pollution concerns of a different type — that arising from solid fuel combustion for household cooking. This ‘household air pollution’ results in approximately 900,000 annual deaths in India - 10% of national mortality. It disproportionately affects the rural poor, who, for the most part, don’t have access to modern fuels for cooking, heating, or lighting. It’s estimated that approximately 700 million people - more than twice the US population - in India rely on solid fuel use for household energy needs. I applaud the NYT for covering air pollution in Delhi and across India. That said, neither of the above articles consider air pollution out of urban centers - and neither address the fact that these types of pollution events were commonplace in now-developed countries (see Donora, PA; London Smog; Thanksgiving Day Smog, NYC, 1966 ) as they stumbled in search of progress. It’s a little odd being back in Kathmandu. Much feels the same — congestion, pollution, tourists. Silent places pepper the roads, close to and worlds from busy intersections. Beautiful old crumbling Rana palaces, inhabited by the packs of wild dogs that still control the city. It feels as though it would be easy to fall into old work and life patterns - a welcome thought. Familiar haunts have been reoriented, reorganized, redistributed, relocated. Some roads have gone from crudely paved to stone tiled. The palace — on lock down during past lives here — is open, a museum to an abolished monarchy, its end initiated in violent bloodshed. A spot we visited often, for tourists of all ilk, once lived down a little alley. It still lives in the same place, but the alley has transformed. It has widened, opening up into a brick megaplex full of shops catering to tourists. It is like many of the paths here that converge on large central squares and are often adorned with stuppas, small shrines, and clotheslines. On the streets, traffic appears much the same — though far fewer UN vehicles plow through intersections and around corners. Perhaps the UN mission here has been downsized. Perhaps my sample size of two days is far too small. Fat, almond-shaped rain spewed from the sky yesterday for four and a half hours. “Pre-monsoon,” the hotel staff said. Memory must have erased the Kathmandu monsoon from my neurons — I have no recollection of rain like that. The streets filled with inches of water. Shops closed their front gates in an attempt to keep the rain out. Fellow KGH residents - with plans for meals out and about dashed - congregated in the small, overpriced, hotel restaurant. Near Bishal Bazaar, Tip Top Tailors still serves the ultimate, mouth-scorching samosa. Amidst hundreds of similarly named tailors, on a bustling and wide road, two small signs point down a corridor to the legendary snack vendor. The largest clue that you’re in the right place is a steady stream of people entering and existing a narrow alley (which, like others, opens into a wide courtyard, this one with rich smells swirling about). Wandering there yesterday, old muscle memories guided me right to the spot. Another nice bit of delight. Despite the gradual expansion of the city through the entire valley, KTM is still a small place. It’s unsurprising, then, that I ran into an old friend today. Now married to a Nepali, he runs an environmental consulting firm in Kathmandu, and is pulling off feats with rainwater harvesting, biosands, and soon cookstoves. He’s transformed — still American, but Nepali, too. Into the fire — off to Delhi in four short hours. Temperature don’t seem to drop below 90-95, even in the early morning. But in New Delhi on Thursday, air pollution levels far exceeded those in Beijing, only without any government acknowledgement or action. It is not the first time pollution in India’s capital has outpaced that in China. At the University of Delhi’s northern campus at 12:30 p.m., the reading for PM 2.5 was 402 micrograms per cubic meter; in the eastern suburb of Noida it was 411; at the Indira Gandhi International airport it was 421. Having spent winters in Delhi, I can attest to the intensity of the air pollution. Part of the problem, like in other large cities, relates to winter meteorology; another significant component is the location of industry and power production in close proximity to urban population centers. I’m working on culling the data from the Indian Ministry of Earth Sciences air pollution monitors; check back soon. Q: What do a broken fuel injector, a helicopter evacuation, a plague of diarrhea, a minor tornado, and Rohtang Pass all have in common? A: The 2012 Himalayan Health Exchange Kargiakh expedition. More on all that later, though. We made it through the whole trip relatively intact. The trip was long and productive. Around 600 people came through the public health and medical camps, with complaints ranging from simple osteoarthritis to worms to primary syphilis (yup!). We were able to sample indoor air quality in six villages across the Zanskar valley - a minor miracle. Remarkably, the levels of pollution during this time of year seem to be a bit lower than expected, though we won’t be able to say anything definitive until we do some more thorough data analysis. The team arrived post-trek in Manali late on August 24th after a harrowing drive down Rohtang pass. The sky was thick with cotton-gauze fog, sharply contrasted by sticky, dense brown mud smothering the road. Our bus met them both, sliding around corners, sometimes narrowly avoiding steep drops, all the while pummeling through pea soup. The driver performed admirably, exhibiting nerves of steel save occasional bouts of hyperactive profanity. The passengers did alright, as well, though they were clearly many frayed, over-stimulated synapses at the end of the bus ride. Manali is a kitschy oasis of hot showers, beer, and wandering Druids. Our motley crew fits in well and is re-finding their footing among the modern. We head to Delhi by bus in a few minutes, another long sojourn before we all disperse to our separate homes around the world. It’s been a great trip - and one I look forward to describing more in the coming days. Made it to India Sunday night around midnight. Skirted through customs and baggage claim with little incident. Was stopped on the way out by a well-heeled, well-dressed fellow asking what was in my bag (not much outside of clothing and some teflon and quartz filters). Managed to talk my way out of a bag search, and then emerged from the airport into the stifling, 88 degree heat. It was 11:30p. It was 88 degrees… at midnight. My glasses fogged up, sweat beaded on my forehead, and it finally registered: I was back in the motherland. A short drive later, I found myself at a family friend’s house in Noida (which has grown, emboldened by status, into a thriving metropolitan suburb of its own). The apartment building (Stellar Kings Court) was well outfitted. I collapsed into a fitful sleep, interrupted by what turned out to be one of the largest power outages India has ever faced. An estimated 370 million people — about 60 million more than live in the U.S. — were without power for at least part of today in northern India because of a massive failure in the country’s power grid. It was “one of the worst blackouts to hit the country in more than a decade,” The Times of India reports. The outage turned the [Monday] commute in New Delhi and other major cities in the north into chaos as trains couldn’t run and traffic signals went dark, correspondent Elliot Hannon tells our Newscast Desk. Monday’s blackout could have proved more crippling if not for what might be called India’s unofficial power grid — the tens of thousands of diesel generators and inverters, most privately-owned, that serve as backup power sources during the frequent localized failures. Many hospitals across the region are equipped with backup generators, as are many office buildings and government offices. In New Delhi, many homeowners also have their own private backup. India’s power supply has been especially tested during this year’s hot, dry summer. Electricity use has skyrocketed, especially in large metropolises like New Delhi, home to more than 16 million people. In recent weeks, with a poor monsoon, New Delhi has set new records for energy demand. The scale of Monday’s grid failure was enormous. Beginning at 2:30 a.m., the entire state of Rajasthan, with 67 million people, lost power. Power failures also affected the states of Uttar Pradesh, Punjab, Jammu and Kashmir, Himachal Pradesh and Haryana, as well as the Delhi metropolitan region, which includes the capital, New Delhi. The capital’s seven water treatment plants, which require hundreds of megawatts of power, also temporarily lost power. However, officials said water service was fully restored by early evening. Update: Power has been lost throughout the North + East of India for a second time. At 1:45pm Tuesday, demand in Delhi peaked at slightly over 4000 MW. Supply was measured at 38 MW. There was a recent thread at Quora titled, “What are some English phrases and terms commonly heard in India but rarely used elsewhere?” It is really, really priceless. I find this kind of thing fascinating, and know many of the smarter out there know more about the academic and intellectual underpinnings of adaptation of a language to local culture, circumstance, region. Fascinating, though, how a foreign language, once adopted, grows to become something unique, evolving, unto itself. I can’t help but think that part of the unique change that occurs during this adoption process is just bootstrapping words and phrases — say in Hindi — to an approximate equivalent in English. Throw out some of the confusing conventions that English speakers take for granted, and it can feel you’re speaking two distinct languages. That reminds me, I should get my pre-paid converted to post-paid to make sure there is no hassle with roaming. The operator tells me that under the current scheme roaming is free but always the possibility for screwup is there. But the paperwork for updation is too great. Every time wanting same to same KYC. Limited timings, phones always engaged, very much difficult. They trouble you like anything but never answer any of your doubts. Tell me, what is one to do yaar? They are like that only. I need to prepone some meetings to arrange for the trip so I need to rush due to the same, but not to worry, I will keep you initimated of my progress. Will give you a missed call when I deplane upon returning back. Gymming: In-house version of ‘Working out’. Have you been gymming lately? Hope your head is not paining, I didn’t mean to eat your brains. I will offer a translation in a few days. Now it’s time to slow the volume, increase the AC, and off the light because sleep is coming. Kindly to stay in tune. Paining always gets me. Eating brains evokes the zombie apocalypse. Everything is lost — and found again — in translation. We find no evidence of improvements in lung functioning or health and there is no change in fuel consumption (and presumably greenhouse gas emissions). The difference between the laboratory and this study’s field findings appears to result from households’ revealed low valuation of the stoves. Households failed to use the stoves regularly or appropriately, did not make the necessary investments to maintain them properly, and use ultimately declined further over time. More broadly, this study underscores the need to test environmental and health technologies in real-world settings where behavior may temper impacts, and to test them over a long enough horizon to understand how this behavioral effect evolves over time. Cheers to JPAL for bringing in researchers from diverse backgrounds to think about and work on household air pollution and cookstoves. The field moves forward when alternative perspectives force us to think in new ways. The rub, though, is that many of us in the field are acutely aware of the explicit requirement that any intervention be fully vetted with the community before being deployed. 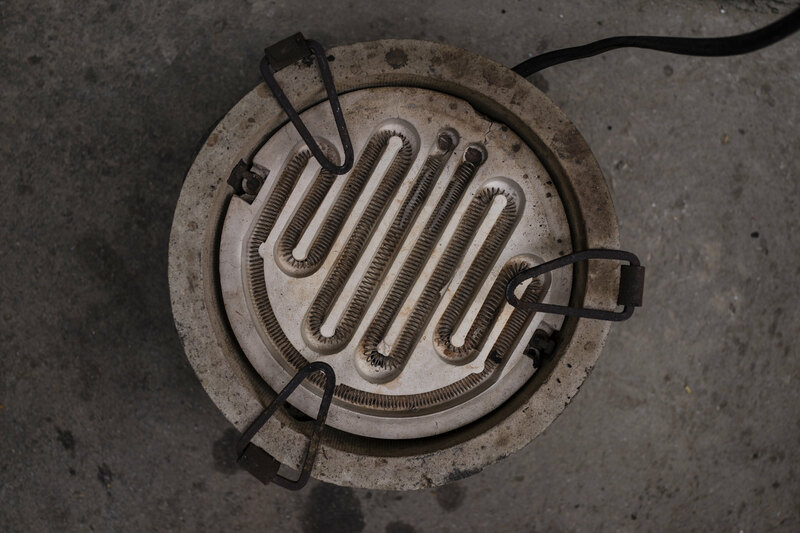 This isn’t the first time the development world has been interested in cookstoves; past large-scale interventions have had mixed success in part due to precisely what’s outlined in the article. Fully vetting devices in the community to make sure they are culturally appropriate, usable, clean, and efficient is a known requirement. There’s always a chance an intervention will still fail, but due diligence dictates prolonged and complete community engagement. Because a product is available on the local market and has claims of “proven” laboratory performance means little. The laboratory provides a first step to grade stoves — but the field is where final decisions should be made. And the value of an ‘improved’ label is heavily diluted - we’re barraged by dozens of these products regularly. We derive value from meaningful, beneficial, and unobtrusive interaction with and use of appliances. Devices that fail to provide those traits fail to be used. This is definitely true here and seemingly true everywhere. Two fundamental conclusions from the recent brouhaha stand out. First, the astonishing hype surrounding this article fits within the larger patterns we see in the news machine. A single article, statement, or editorial snowballs and catalyzes a lot of discussion (in the popular media for a news cycle, and in academia for an eternity). Not a bad thing in and of itself, but problematic when the media ignores the history of available knowledge and treats the news as something profoundly new and unequivocally true. Second, the coverage helps focus and hone the message of those working in the field — never a bad thing. It reminds us of past learnings and helps light a path forward. This research, and the work of others, suggests that the first goal must be to develop cookstoves that people would actually want to acquire, use, and maintain—in addition to ones that meet clear guidelines and standards for cleanliness, efficiency, and safety. To ensure that scarce development resources are spent wisely, all promising cookstove designs must be tested in real world settings to assess their long-run benefits on health and greenhouse gas emission prior to large scale adoption of clean cookstoves. Moreover, additional research should continue in order to provide greater insight into what types of social marketing can improve the general acceptance of the stoves.